World Snooker Championship Day 12: Ronnie O’Sullivan, Stephen Maguire, Ali Carter and Matthew Stevens are the four players who advanced to semi-finals. 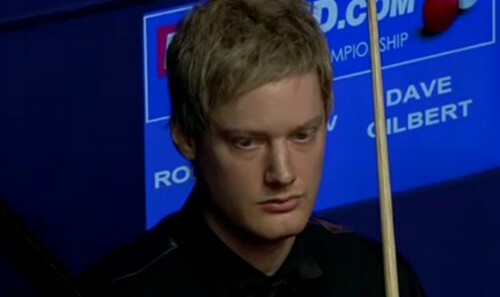 The Rocket trailed Neil Robertson by 3-5 after the first session. The three-time World Champion had a brilliant performance in the second session, taking six frames in a row to lead Robertson by 9-5 with a few quality breaks. Despite struggling at the afternoon, the 2010 World Champion claimed last two frames of the session to trail 7-9 before final session kicked off. Ronnie had a healthy lead 12-8 over Robertson with runs of 100 and 104 but Robertson swung back to trail 10-12 with 89 and 77. Ronnie killed the match with 59 in the frame 23 to beat Robertson by 13-10. Following his victory, the 36 year-old said: "It's nice to enjoy the game, and to play with openness which is my natural game. Robertson said, "I played too slowly in the afternoon - I just couldn't get going, I couldn't get any rhythm. On his opponent, O'Sullivan added: "Neil's had a great tournament, he's been fantastic and he's had another good season." Ali Carter came through tests from Jamie Jones with scoreline of 13-11 to advance to semi-finals. Carter led Jones by 9-7 in the previous session, he made a good start to be 12-8 up on Jones. The Crucible debutant took the following three frames. The pressure is now on The Captain's shoulder. Carter who overcame Trump in the last round held his nerve to win with a break of 73. "What an incredible performance [from Jamie] to get through to a quarter-final and make so many century breaks, he's an awesome player, gutsy as you like. He reminds me of Graeme Dott, always there on your heels and it was only my safety that won me the match." Jone said, "I'm so at home out there I can't really explain it, I've loved being here, it's been the best experience of my life. Stephen Maguire saw off Stephen Hendry yesterday by 13-2 and therefore he got a session to spare today. Tomorrow will be down to one table set-up, with Maguire versus Carter and O'Sullivan versus Stevens.